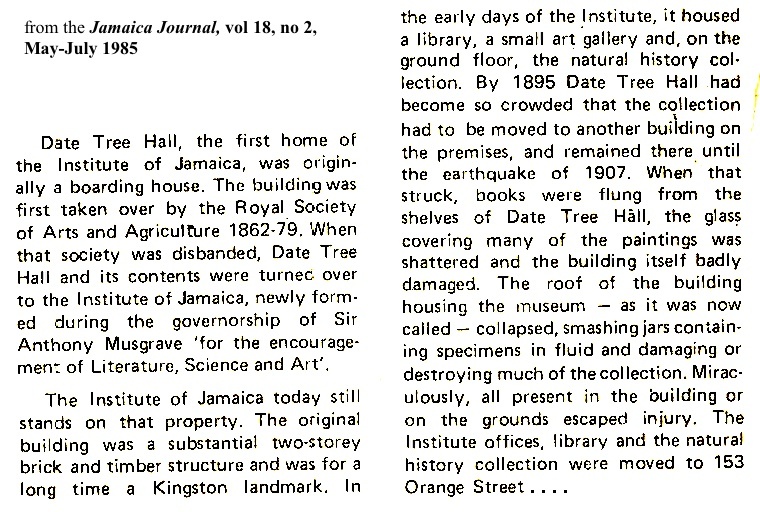 Date Tree Hall, original home of the Institue of Jamaica. Just today (2015/06/05) found these references to this magazine, which does not appear to have made it beyond this first issue; so far I have not been able to find any references to a copy of this single issue in any library or other depositary. It is especially interesting in that it contained a first part of a story written by a young 'Tom Redcam', and I haven't found any other references to that story either. All very intriguing! . . . . the family made a third migration, and a radical one. It went to the Cayman Islands for economic reasons and stayed there for almost six years. 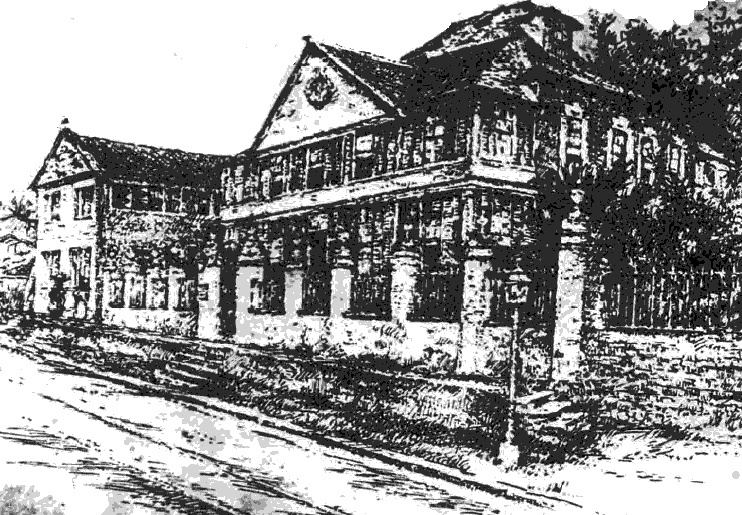 Tom established a school at West Bay, Grand Cayman, where he taught all the lower grades and introduced some of the features of secondary education. He founded a school library and organised cottage entertainments. Driven by an impulse to overwork himself, he showed a disregard of health and comfort which became more and more marked as he grew older. His home was at Georgetown, five miles from West Bay, and the trip morning and evening put an extra strain on him. 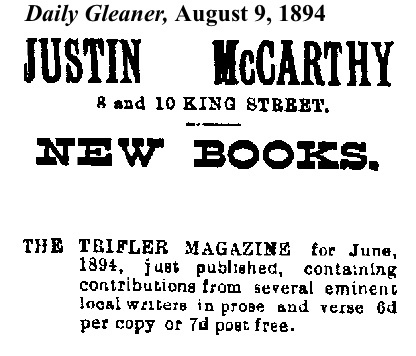 He also started to do newspaper work, acting virtually free of charge as the Cayman correspondent of several Kingston journals, including the Gleaner. It was good practice, no doubt, but he does not seem to have written anything at that period that he wished to preserve. His larger interests were assuming form, and he began to correspond with writers and editors abroad. 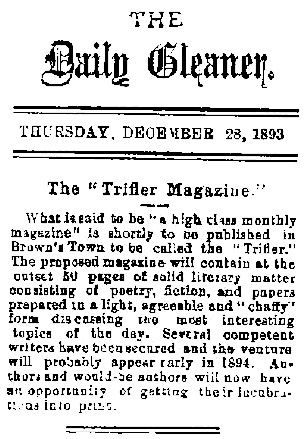 W. T. Stead of the Review of Reviews, then one of the most prominent fighting journalists in England wrote him an appreciative letter. I feel that the isolation and intellectual loneliness of his years in the Cayman Islands fixed the pattern of MacDermot's ideals. Ascetic by nature, he deliberately chose a course of self-abnegation from which he never swerved. The decision might not have been reached at quite so early an age if he had stayed in Jamaica. But he would have arrived at it nonetheless. There was a strong resemblance between his temperament and that of Jose Marti, whom Cubans call the Apostle. The climax of Tom MacDermot's efforts in Grand Cayman was a severe nervous breakdown, which forced him to return to Jamaica for medical treatment. He was to be ill for a year, as it turned out, a year of mental anguish and depression. The Rev. W. Clarke Murray, head of York Castle school, was his uncle-in-law on the mother's side. The Murrays took care of him during his illness, and Dr. Murray's conception of public service had a lasting effect upon his mind. Tom became one of the teachers at York Castle. 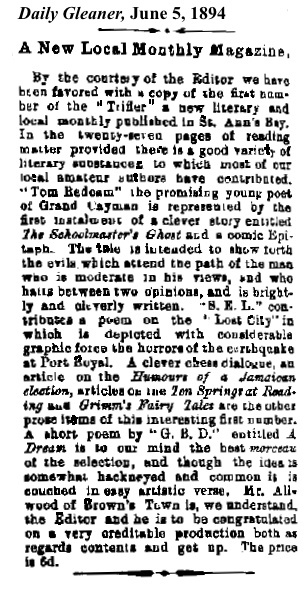 While he was there he wrote much prose and verse, adopting the pseudonym Tom Redcam, which is simply MacDermot spelled backward, and publishing under that name in the Kingston newspapers and the old Victoria Quarterly.